Whom would you rather have for your team? ko242 and Bavarian14 repped this. I always felt like post injury Ronaldo was a more prolific goalscorer than his former self. He scored a brace in his debut for Madrid, a hat trick against Man U in UCL etc. That's in itself correct (even excluding his penalties), but don't overlook goals per game suddenly increased with 30%, most likely as a result of the back-pass rule. Signori also played as many games as those two combined..
Just to make things clear the purpose of this discussion is to compare the best strikers at their peak. I've only mentioned my top 4 strikers. Perhaps you should volunteer and rate the others. I've picked a random great season of the player. How are you going to compare them? This is so tough! As @carlito86 already said, R9 post 1999 probably shouldn't be here, certainly not ahead of his contemporaries like Shevchenko, RVN, Thierry Henry etc etc. It's a tough one, but if forced to, I'd go for Van Basten. I think he had the more polished all round game. I don't know if the question is who I'd have in my dream team or my literal team (Juventus). In a dream team Romario is my favourite but I'd still go with MvB, in my literal team (Juventus), MvB even more so, he's the one who'd connect with CR7 the easiest and he'd bring Dybala into the game more naturally. ko242 and carlito86 repped this. If I have to make a pick I'd say Ronaldo (his 1997-1998 version) and Van Basten. Those are the two who were stellar at all levels (domestic, continental, national team) during their selected peaks and were in their time just rated a bit higher as the others. Ronaldo was for a moment the undisputed best player in the world, and there was speculation about him becoming a 'best ever' candidate. It's true (and documented) that some serious orchestrated hype was behind this, and he was generally less spectacular against the stronger opponents (notable exceptions are Netherlands 1998, that played with a makeshift defense, and Real Madrid in 1998 - excellent watch is that). I'm less convinced by the often voiced asterisk of "Ronaldo has only 1 league title, 0 champions leagues and 1 or 2 domestic cups". Surely Real Madrid imploding at the end of 2003-04 after Ronaldo got injured (for example) also tells something about the influence and contribution he could have. Van Basten was also rated high for his contribution and at some decent polls he even made it above Maradona. Of course it is all a team effort but I think those two had considerable input (in different ways) for their teams. MvB also achieved two things that many of his Milan buddies did not: 1) a national team trophy as star performer (against four top five teams per Elo ranking), 2) respectable achievements with another club team as the captain (Ajax). Something similar applies to Ronaldo. Romario is not the most reliable character and Batistuta his effectiveness and contribution decreased when the spaces got smaller and his team pushed for a win (Batistuta has to be ranked among the best league strikers off all-time, possibly the best 1990s striker overall). Could you rank the top 3 individual campaigns by Marco Van Basten without wholly focusing on trophies won but rather on when he was at peak physical condition and also when he was most decisive? Realistic team obviously. I don't generally like the idea of dream teams. Then for sure Van Basten, by my reckoning he's the most complete striker that ever lived. If you mean league campaigns then imho 1985-86 has to be somewhere among those three. He had 1.42 goals per game (37 in 26 games) and other than some 1950s names who are around 1.1-1.2 there is no other who is close to this. Not Romario, not Bergkamp, not Van Nistelrooij, not Ronaldo, not Suarez, not Larsson, not Ibrahimovic, not Huntelaar, not Geels (who was 6th in BdO) etc. Even if players and their creative input aren't only about goals, it is one of the outstanding artifacts that he left behind (both Ajax and Oranje did worse in the matches he missed). I understand the idea he was physically hindered at Milan (he got the injury November 1986) but it would be erroneous to leave one of those league seasons out of the top three. His overall average of 0.61 goals per game is (again) only bettered by 1950s names. So one of those seasons (maybe this?) have to be in the top three too. 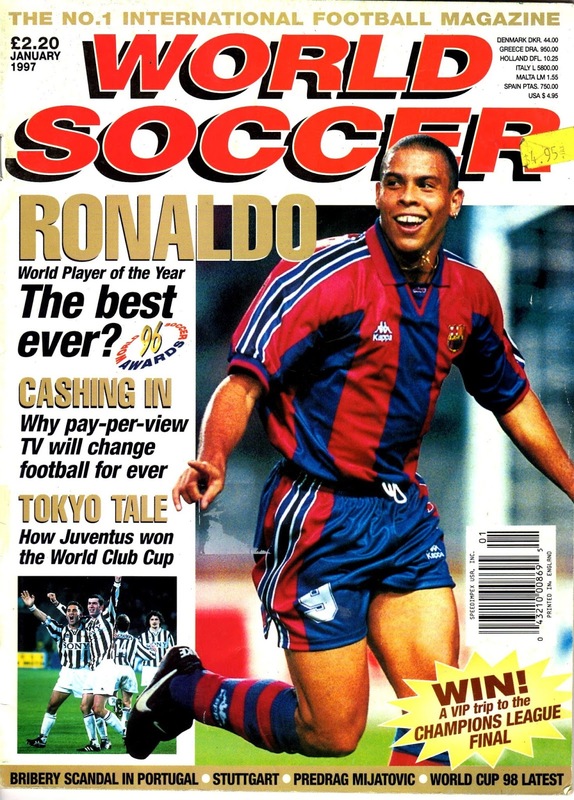 Ronaldo is for me obviously 1996-97, 1997-98 and 2002-03 as the top three. He scored one more goal and one more assist in 2003-04 (and Real Madrid had a meltdown when he got injured, despite some excellent alternatives) but think his overall game and influence was better in 2002-03. Maybe that also 1994-95 is a possibility. edit: To be honest, I am far from convinced that Romario only rated the World Cup (in which he, if we are honest, wasn't motm material against the best elite opponents he faced, Netherlands and Italy). Here at the end of 1992 he rated Van Basten as best in the world. Here in 2018 he insists MvB has to be in his Europe XI (btw, notice here 6 of the 11 did not win the World Cup). And that are only two examples, related to this thread. People here are more informed about Van Basten than me. My inclination is to say R9. I don't think Van Basten was ever considered a possible GOAT candidate. R9 was the GOAT to many who grew up in the 90's like me. He was our GOAT. By the time early 2000's came about, he already lost a step because of injuries. Still devastating on his day but not the wrecking ball he was in the late 90's. What I mean here is more clinical and most probably more versatile. The idea that R9 is in his own special category in terms of number 9s isn’t substantiated by anything. Are we going to put Eusebio in his own special category? Remember Van Basten's career overlapped with a GOAT candidate. His Euro88 was amazing, but Maradona's WC 86 was still fresh in the memory, and even despite this he still compared favourably in his peak, in the same league too. It's like R9's 96-98 falling around Messi's prime. For the most part I tried to answer the best league seasons. That is what you asked, and you asked to ignore the trophies for a moment. Yes 3.1 goals per match is relatively high, but it is lower than aforementioned 1950s guys (3.5+ goals per match), and also lower than the league in 1994-95 (Ronaldo, 3.2 goals per match). Romario in his best season was at 2.96, Suarez 2.92, RvN 3.0 etcetera. You can compensate for this and then 37 goals in 26 games is still a big outlier. Many legendary (league) strikers operated in a high goals per match environment. Puskas at his peak 3.3, 3.4 and higher (in the Hungarian league 3.9 and higher); Muller 3.3 at his scoring peak andsoforth. Eusebio his 1967-68 season is scoring wise less of an outlier in his own league. I.e. Yazalde came to 1.60 goals per match, Mario Jardel to 1.40 (in case of Jardel in a league with 0.21 lower goals per game). Eusebio is in my view the best overall European player of the 1960s, but if you add in that he was playing for the best team (with largest stadium) etc. his scoring is less of an outlier. Jardel, Yazalde, Fernando Gomes and the likes are for most people also not quite the same pedigree as Romario, Ronaldo, Suarez, RvN et al. He won the golden shoe for 1985-86. He won silver for 1983-84, behind Ian Rush at his peak. At that time he was the youngest podium finisher. He scored indeed 6 goals in one match, and was the first since Cruijff in 1970 to do this (two guys in the 1950s did so too). After MvB, no one else did it for over two decades. Goals per game in 1986-87 was 3.0 - in what way was this season more balanced? He won the Eredivisie three times, albeit the first time as a bench player... You also asked to ignore this for a moment and indeed, that he didn't play for the best or richest team in 1985-86 doesn't subtract from his season. He simply wasn't playing for the outright best and certainly not the richest team. But it is not only the goals; he helped to make his team (a lot) better for sure. There were two awards, one by the press (average grade) and one by the professionals in the field. Defensive players had generally an advantage for getting high average grades and the young Ronaldo was also erratic and still learning. I've posted a documentary in the past, showing he received criticism from the manager for his team-play. There were games where Ronaldo received a 4 or a 5. The professionals nominated two Ajax players (Overmars, Ronald de Boer), who were at that time setting unbeaten records domestically and at continental level unbeaten records. The third nominated player (and overall winner) was PSV team-mate Luc Nilis. Nilis wasn't at his most prolific but his overall game was very good. Ronaldo has regularly mentioned him (against Spanish and Brazilian media) as the best partner/player he played with (same for RvN). So in a nutshell: for the press thing it was always hard for strikers to be among the first three. Ronaldo had a down phase in the middle of the season. For the professionals award he was up against a record setting Ajax team (records domestically and abroad), with the pretty rounded game of Nilis getting due recognition. Whether their respective career achievements are the same or worth the same is a totally different thing.